On April 9, 2018, UBC hosted a ceremony to officially open the Indian Residential School History and Dialogue Centre. At the ceremony, Professor Santa Ono issued a Statement of Apology for UBC’s involvement in the system (see for coverage/responses). The Indian Residential School History and Dialogue Centre is one of two UBC initiatives that aim to capture the long trajectory of Indigenous and Canadian relations and to ensure that one part of that, the history of Canada’s Indian residential schools, will never be forgotten. The other initiative, Reconciliation Pole, was installed on campus in April 2017. The centre provides Indian residential school survivors, their families, and communities access to the records gathered by the Truth and Reconciliation Commission of Canada (TRC). The TRC documented the history and abusive nature of the Indian residential school system that operated in Canada for more than a hundred years. A second function of the centre is to inform faculty, staff, students, and other visitors, about the history and lasting effects of the Indian residential school system, and to help them to understand larger patterns in history as a context for thinking about contemporary issues and relationships. Webcast sponsored by the Irving K. Barber Learning Centre and in partnership with the Faculty of Land and Food Systems, with support from the UBC First Nations House of Learning, the UBC Department of History and Kloshe Tillicum (Network Environments for Aboriginal Health Research). Shortly after WWII, when knowledge about nutrition was still sparse, scientists in Canada took advantage of already malnourished aboriginal communities by using them as research subjects to investigate the effects of different diets and dietary supplements. Evidence of these government-run experiments was brought to the forefront by food historian and UBC History alumnus Ian Mosby, and the research has gained widespread recognition. Sometimes the experiments involved decreasing food intake or withholding supplements. Hundreds of indigenous people across Canada were included in the experiments, of which they had no knowledge, and many of them were children in the Indian Residential School system. The fallout from this unethical treatment is still having an effect today. Join us for a panel discussion about this distressing era in Canadian history and find out how UBC’s Faculty of Land and Food Systems is working to address issues such as access to healthy, traditional food; food security for all; and land stewardship. Shortly after WWII, when knowledge about nutrition was still sparse, scientists in Canada took advantage of already malnourished aboriginal communities by using them as research subjects to investigate the effects of different diets and dietary supplements. Evidence of these government-run experiments was brought to the forefront by food historian and UBC History alumnus Ian Mosby, and the research has gained widespread recognition. Sometimes the experiments involved decreasing food intake or withholding supplements. Hundreds of indigenous people across Canada were included in the experiments, of which they had no knowledge, and many of them were children in the Indian Residential School system. The fallout from this unethical treatment is still having an effect today. The February 11th “Speaking My Truth” dialogue session, held at the First Nations Longhouse, presented a unique opportunity for discussion with Shelagh Rogers, Mike Degagné, and Glen Lowry, three creators of the book, Speaking My Truth: Reflections on Reconciliation and Residential Schools. The conversation that took place between the audience and these three speakers was thought-provoking and illuminating. The three guests provided insight into their motivations and experiences in creating their book and also gave their views on the progress and future of the truth and reconciliation movement in Canada. The speakers acknowledged that tremendous progress has been made in drawing public attention to the stories of residential school survivors. However, they emphasized that, while it is important to tell these stories and expose the truth of residential schools, progress still needs to be made to reconcile these injustices. Gestures such as the official apology by Prime Minister Harper are appreciated, but must be backed up with productive dialogue and positive action, in order to construct a relationship of mutual trust and respect. Only after this relationship is established can true reconciliation and justice be achieved. ~ Nick Rowlands, February 18, 2014. I have read exactly two books about hockey. The first, the Hockey Sweater by Roch Carrier, is now a celebrated story, so quintessentially CanCon that it counts among its adaptations both a National Film Board animated short and the five-dollar bill. There are those who may find it ironic that the iconic work—translated from the original French Le chandail de hockey—is undeniably more Québécois than Canadian but after all the sport is our nation’s game, and indeed, part of the very fabric of our identity. It is the second book, Richard Wagamese’s Indian Horse – titled after the English-language surname imposed by the Zhaunagush (white colonizers) on an Ojibway family – that calls into question these very assumptions. For Saul Indian Horse, the central character and narrator of the story, hockey is an escape, at first metaphorically and then literally, from life at St. Jerome’s Indian Residential School (the word ‘life’ here being hyperbolic; for Saul and the other Aboriginal children at the residential school, existence has been reduced to the singular act of surviving). St. Jerome’s is described as “hell on earth” but despite the torment and many abuses suffered by students at the school and documented by Saul, for the reader the pain is less of a vivid, visceral experience as it is a dulled registering and then repressing of emotion. There is a distance to Saul’s descriptions of his time spent at the school; a fog, the same greyness of the tasteless gruel fed to the students, and produced by a reluctance to reflect on the ordeal of the situation, envelopes all of St. Jerome’s. It is only when Saul is playing hockey that the fog lifts and he can see clearly again. Saul is first introduced to the game by Father Leboutilier, the young priest at St. Jerome’s who loves hockey so much that he coaches a handful of boys and puts together a team for the school. Saul is enraptured by the stop-and-starts of gameplay and the scramble of the scrimmage but soon enough, he can read the game, slow the rhythms behind the movements of both puck and players, and anticipate the flow of play. In other words, he has a God-given talent for the game, and it is this divine framing of both sport and skillset by Father Leboutilier that convinces the school to allow Saul to leave St. Jerome’s in order to pursue hockey, join a reserve team, and play Native tournaments. But once outside the residential school system and even with the promise of all the hockey he could ever want to play, it is still not a world without its darkness for Saul. Hockey elevates him, lifts him up and takes him above and beyond being a victim. It serves as a buffer for the anger and the grievance he feels for what has been taken from him, his family, and his community by the Zhaunagush, but this is gradually worn down as his team encounters widespread, systemic discrimination and profoundly personal harassment when they begin to play off-reserve and against white teams. Saul continues evolving as a player, advancing through the ranks of elite athletes until he’s vying for a spot on the Leafs feeder team. His efforts to hold onto both his dignity and his integrity for the sport, however, do not move forward. Eventually, even the electric intensity of hockey cuts outs for Saul and the world goes dark again, the “great game” revealed as only a Wizard of Oz sleight of hand for hiding his hurt, not a total transition into Technicolor. In Indian Horse, Ojibway author Wagamese has created a rich and nuanced portrayal of a grief that is hard to give voice to: because the pain had seemed immemorial—an intergenerational inheritance—or was, consciously, deemed immemorable—a threat to one’s very survival. Like Saul, and for many in the Indian Residential School System, there were no words for the pain because the words themselves had also been taken away. Whether unintended or done deliberately in acknowledgement of this, a quiet lyricism permeates much of Wagamese’s work; the effect makes for storytelling that is surprisingly visual, be it the haunting bleakness of St. Jerome’s or the multidimensional plane of the ice rink where energies, movements, and intentions can all be seen and read by Saul during gameplay. Those who don’t know much about the sport and worry that the story would be lost on them should know that Indian Horse is not a hockey book, not really, but one about the human capacity for hurting, and healing, ourselves. For those who don’t know much about the Indian Residential School System, its legacy, and the process of reconciliation, the story is thus a good starting point—Wagamese’s free talk on Thursday, October 31st at 2 pm in the Lillooet Room in Irving K. Barber Learning Centre is another. This post is a follow-up to last week’s report on the TRC B.C. National event panel “Institutions of Memory” and discussion of the role of academic institutions in the process of reconciliation. While Mike DeGagné, President and Vice-Chancellor of Nipissing University and former executive director of the Aboriginal Healing Foundation, acknowledged the university as an “academy of assimilation,” he argued that it was still well positioned to foster understanding among its students of the history and impact of the Indian Residential Schools. An example of how this is being done at Nipissing University is by making the book Speaking My Truth: Reflections on Reconciliation & Residential Schools available to all first-year students when they move into on-campus housing—not unlike a Gideon Bible in a motel bed-stand. However, as not everyone may feel compelled to read the book, the university must do even more; instead of just preaching to the choir, the goal is reaching everyone, including those who graduate from high school without ever having learned about the Indian Residential School System. An important second step, said DeGagné, is then making sure that the teachings and the truth of what happened are integrated into the curriculum, as well as taken outside of the university and back to communities. Jonathan Dewar, director of the Shingwauk Residential School Centre (SRSC) and special advisor to the president for the Residential School Legacy at Algoma University, spoke at length about the value of doing just that. At Algoma University in Sault Ste. Marie, Ontario, on what was once the Shingwauk and Wawanosh Indian Residential Schools property, there is now an education and visitor centre devoted to the research, collection, preservation, and display of the history of the residential school system. The SRSC is also the site of “Remember the Children: National Residential Schools Photo Identification Project,” an initiative between the centre and the Children of Shingwauk Alumni Association, which provides safe space for survivors to look through photos of their time at the schools and fill in the gaps in their memories in order to engage with the past and begin to move on from their trauma. The heartful and heartening discussion of projects and programming at the SRSC, and their role in supporting the healing journey of residential school survivors and families, was not only a reminder of the importance of having a National Research Centre (NRC), but provided a powerful and positive example for university involvement in the reconciliation process. In particular, Dewar emphasized that commitment and guidance of community members were required in order to make the program a success. He also called attention to the reciprocal nature of the relationship between community and academia; while librarians and archivists cannot do the work that survivors do, survivors need the expertise of librarians and archivists, who can make materials like photos, records, and reports, accessible and thus transformative for individuals. According to Shelley Sinclair, university archivist at the University of Manitoba, there are some 200 terabytes of materials for the NRC, including survivor testimonies and recordings of TRC events. And while the National Research Centre at the University of Manitoba will act as a central repository for a country-wide distributed research network (including a proposed site on UBC campus), it is also intended to be public, open to community input, and interactive. In order to achieve this, digitization of materials is not in of itself a solution, a means to an end, or a way of bypassing the need for involvement of librarians and their skills as information professionals. This was made clear by the panellists in response to a comment from the audience that questioned the need for a physical centre when technology could one day allow all materials to be put on an external hard-drive and sent out to individuals, putting the materials and documents of the residential school system into the hands of survivors. While having an institution charged with the ownership of school records may seem paternalistic, the panellists explained that stewardship is required in order to provide and apply a classification scheme or organization structure for easy retrieval of materials and a way for people to make sense of the wealth of information and materials available to them. Having a central repository also creates the possibility of interactivity by allowing community-generated contributions and annotations to be added to a document by an individual but then shared with everyone. Interestingly, a follow-up question provided an additional criticism of digital technologies, but from a perspective that this time saw digitization as a threat rather than a quick fix to issues of access. One audience member worried that concepts like a research portal and online access to data were too individualistic, isolated from community, divorced from the tradition of sharing circles, and at odds with the holistic ways of knowing within Aboriginal communities. The question was not so much about finding materials, but rather how one could possibly take in all the data and derive wisdom from it. Camille Callison, Indigenous Services librarian at the University of Manitoba, replied to the comment by first emphasizing that the NRC was only intended for materials related to the residential school system, and was not a repository of all Indigenous knowledge, community wisdom, or language materials. The centre would also not supplant or replace Elder teachings, experiential learning, or other channels of transmitting knowledge. Finally, she discussed best practices for Indigenous librarianship and knowledge stewardship and how they would apply to and inform the planning and work of the NRC, such as the need to seek direction from communities when developing protocols for access, and consider that intellectual property and copyright are inherently culturally determined values and concepts. For more information on Indigenous information management, knowledge organization, and librarianship, see Xwi7xwa Library’s research guide. To read Speaking My Truth: Reflections on Reconciliation & Residential Schools, check out UBC Library’s holdings page or download the ebook and individual chapters for free online. The Truth and Reconciliation Commission of Canada (TRC) was established to gather testimony on survivors’ experiences of the Indian Residential Schools. From September 18 – 22, the Commission is holding its BC National Events in Vancouver. As part of this process, the UBC community is encouraged to attend, witness and celebrate the resilience of Aboriginal cultures. UBC is suspending classes on September 18 to allow students, faculty and other members of the UBC community to participate in this historic event and other events around the city. These events include an opening ceremony, public and private testimonials, film viewings, educational sessions, archival displays and more. The Library is contributing to the campus-wide initiative by highlighting Indian Residential Schools in different contexts. Our online research guide on Indian Residential Schools in Canada is a good starting point for anyone wanting background information this important, and sensitive, part of Canada’s history. 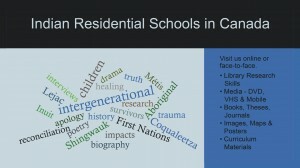 This research guide also highlights UBC’s Indian Residential School Initiative. Several library branches have put up exhibits and displays for the month of September, to highlight Aboriginal issues. The Education Library display features DVDs and books related to the human rights abuses in the Canadian Indian residential school system and related Aboriginal issues (September). The Koerner Library display features books related to Aboriginal issues (mid-September to end of September). 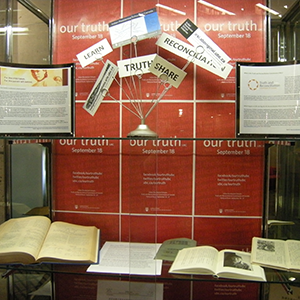 The Asian Library display (pictured) features resources and media on Canadian Indian Residential schools, but from an Asian perspective (September 16 to 25). The Irving K. Barber Learning Centre has co-ordinated an exhibit running from September 17 to October 31. This exhibit encourages its audience to ask reflective questions on its inquiry about this tragic piece of Canada’s history. It features displays from the Museum of Anthropology, the Centre for Teaching, Learning and Technology, Xwi7xwa Library, the First Nations Studies Program, the First Nations Language Program, Musqueam Indian Band (Language and Culture Department) and the Irving K. Barber Learning Centre.